We have been in operation for the last two years. In that time, we have met many different people with Special Needs who have brightened up our lives and made us smile. 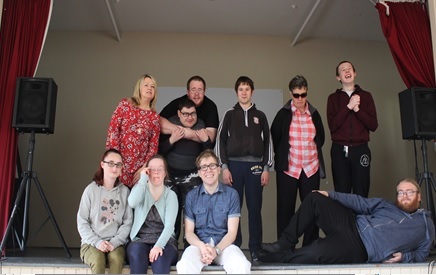 We have worked with different groups around the country, in Duleek Co. Louth, Bray Co. Wicklow, Tullow Co. Carlow and Ballymun Dublin 11. All are very different groups with different levels of needs, but the one thing that all the groups have in common is the need to be included in all aspects of society, and using media can be one way of fulfilling that need. The objective of Media Lab classes is to increase confidence and self-esteem while learning a technical skill and having fun while doing this and we usually achieve this on every level. Quote from one of our groups – The Hub, Duleek, Co. Louth. “Our members in The Hub Training Unit really enjoyed taking part in the Media Lab sessions. It was a great way for them to learn new skills such as photography, interview techniques and filming. They all found it to be great fun and they were able to express themselves in a different way. They all thoroughly enjoyed the Media Lab presentation when the group had finished and enjoyed their families seeing all the good work they had taken part in. “Media Lab promote Advocacy within our group – if you asked our group to go to an advocacy meeting, they would refuse, but Media Lab do it naturally and the group don’t even realise it”. Contact Catherine at 089 4985017 for more details.